Posts for my family, friends and others interested related to my life and those close to me. Verizon’s mobile phone network in the U.S. has the best coverage. Where their digital network does not reach, their analog network does. Verizon’s customer service is excellent. I’ve always reached a customer service agent within 2 minutes and they have been extremely helpful. AT&T GSM, on the other hand, has poor coverage and unreliable voicemail. Sometimes, my phone has run out of battery waiting for an AT&T Wireless customer service agent. Even when I do reach them, they have rarely been helpful. When I requested to switch, AT&T would not release my number to Verizon for two days citing “technical problems”. I’m expecting AT&T to relinquish my number this Friday (after 5 days of several calls to both companies). In the meantime, Verizon has been most helpful and I’m able to use my Verizon phone to make outgoing calls. CDMA technology that Verizon uses is superior to and has many advantages over GSM and TDMA. One of the unmentioned benefits is that if you lose your phone, you can easily switch your number to another phone by calling customer service. There is no SIM card to worry about which is great for travelers and outdoor enthusiasts. If you like to do outdoor things and need mobile phone coverage in remote places, get a Verizon phone with analog roaming support. 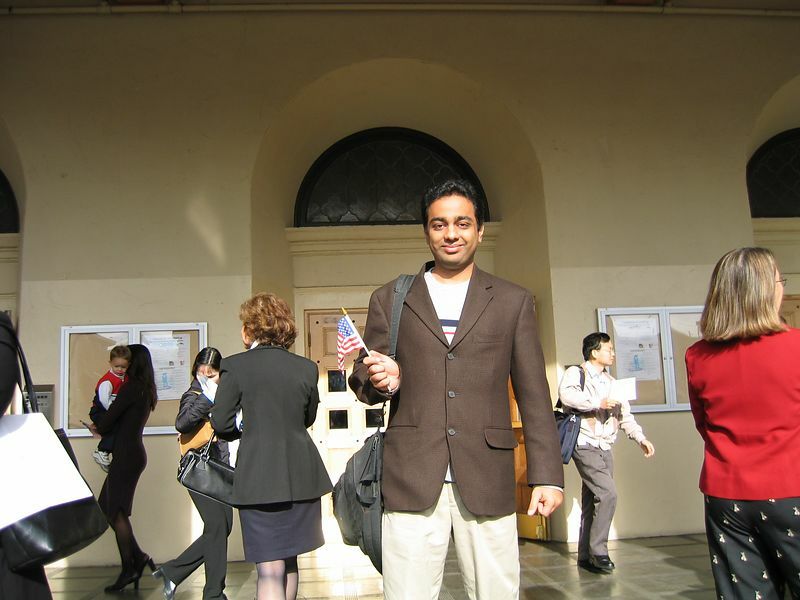 After almost a decade of living in this wonderful country, I am proud to be a U.S. Citizen on November 19, 2003. For this important day, I would like to thank everyone who had a role in my life. Thank you for caring, for your friendships and your love. I am grateful for your guidance, your teachings and for helping me develop in many areas. Here are some pictures from after the ceremony. Hang gliding over beautiful mountains and the beach was great fun, so with land and air covered, I needed to learn to swim. I’m one of those few adults who didn’t learn swimming as a child. So now as I’m learning it, I’m really enjoying swimming — efficiently and fast! Well, it does not fly yet, but what a vehicle it is! 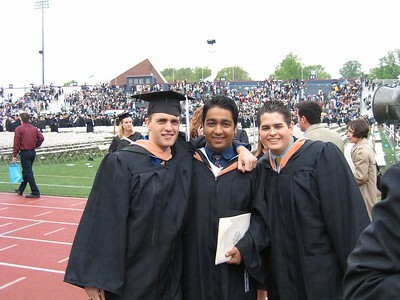 My younger brother Vik graduated from Villanova University with a double major in Management Information Systems and Finance. Here are some photos from my weekend trip to the Philly area. I love to experience contrasts during my travels. Traveling first-class and staying in luxurious hotels is a pleasure indeed, but tourism on a shoestring can be a rewarding experience too. (From ABCNEWS) At age 29, looking at what lay beyond his third decade, Lars Berg knew things weren’t quite right. The San Francisco software product manager itched for something more. His cubicle, he says, had become “both too much and too little,” and he couldn’t shake the growing feeling that he needed to make some serious changes. Over the past two decades, this kind of travel has become increasingly popular with young people from countries with strong currencies, who, instead of taking a vacation from their lives, decide to turn their life into the vacation. I went hang gliding, hiking and sightseeing on weekends recently. Some of the photographs of the scenery around San Francisco look beautiful.